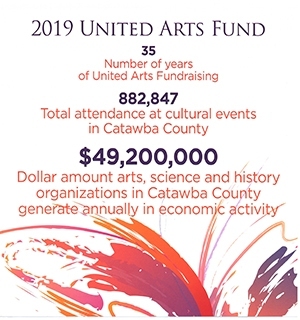 The United Arts Council of Catawba County is committed to transforming and strengthening the cultural life of our community through grants, marketing, fundraising, advocacy and education. We strive to provide awareness of the cultural activities in our area, as well as grant and contribution opportunities. Please get involved! Our arts, science, history and education groups need you! Enter the information here, and your event will be reviewed for addition to the calendar on this website! The United Arts Council of Catawba County maintains this calendar as a planning tool for the cultural community as well as for the general public interested in attending arts, science and history events in the greater Hickory area and Catawba County. Our active, vibrant community is rich with cultural offerings and there are bound to be overlapping events; however you can help us keep those to a minimum by submitting information in a timely manner. The Arts & Economic Prosperity 5 study provides compelling evidence that the nonprofit arts and culture sector is a $49.2 million industry in Catawba County—one that supports 1,442 full-time equivalent jobs and generates $4.2 million in local and state government revenue. ArtBeat is a publication of the United Arts Council of Catawba County. It highlights the activities and events of UAC members and is available in hard copy at these locations. If you would like a printable version emailed to you please use the contact form to request. Request delivery to your email, here. Your tax-deductible donation to the United Arts Fund will help make the arts a part of the life of every citizen of Catawba County, as well as a cornerstone of economic development and education. Consider a making a gift in memory or honor of a loved one. Make a donation today!